We’d love your help. Let us know what’s wrong with this preview of A Grid for Murder by Casey Mayes. Savannah would almost rather drink poison than have tea with Joanna Clayton. Not only is the unpleasant woman one of the worst gossips in Asheville, North Carolina, over tea she flaunts her new assignment creating logic puzzles for a local newspaper—one that has repeatedly turned down Savannah’s work. To ask other readers questions about A Grid for Murder, please sign up. My bad. I'm usually so careful about starting off a series with the first book, but, for some reason, I missed the fact that this was the third book in the A Mystery by the Numbers series. Oh, well. Anyway, this was an enjoyable read for the most part, despite the fact that I came into the storyline a little later than usual. There was enough back story references to give me the general gist of the history of Savannah and Zach. For the most part, I liked the characters and the mystery. Savannah so My bad. I'm usually so careful about starting off a series with the first book, but, for some reason, I missed the fact that this was the third book in the A Mystery by the Numbers series. Oh, well. For the most part, I liked the characters and the mystery. Savannah sometimes had a tendency to rub people the wrong way with her method of sleuthing. I admired her tenacity and determination, but her heavy-handed dealings with the potential suspects sometimes left me shaking my head. The relationship between her and Zach was heartwarming and sweet. This is the type of cozy, small-town mystery I enjoy and, at some point, I will probably go back and read the first two books in the series. I really like this series. The heroine is a puzzle maker (and they give examples in the back!) and her husband is an ex-chief of police, now semi-retired into a consulting job. In this book, she was actually a potential suspect, so she decided to help solve the crime. Great characters -- interesting murder victim! Definitely recommend this series. It’s a shame the series has ended. It’s not the first time a Tim Myers series has been dropped like this and it’s frustrating every time! Freelance puzzle creator Savannah Stone is happily married to Zach, a retired police chief, and is loving life in Parson’s Valley, North Carolina. One afternoon while running an errand to nearby Asheville, Savannah is approached by a not so friendly acquaintance, Joanne Clayton. Savannah and Joanne share a table at an outdoor café, where Joanne boasts to Savannah that she is getting into the puzzle-creating business. Joanne is later found dead – a victim of poisoning. Joanne had plenty of enemie Freelance puzzle creator Savannah Stone is happily married to Zach, a retired police chief, and is loving life in Parson’s Valley, North Carolina. One afternoon while running an errand to nearby Asheville, Savannah is approached by a not so friendly acquaintance, Joanne Clayton. Savannah and Joanne share a table at an outdoor café, where Joanne boasts to Savannah that she is getting into the puzzle-creating business. Joanne is later found dead – a victim of poisoning. Joanne had plenty of enemies, but nobody seems to have both the motive and the opportunity, except for Savannah! Now Savannah must use her skills of deduction to find the real murderer before she is blamed for a crime she didn’t commit. Luckily, her husband Zach is by her side also trying to find proof that someone else killed Joanne. Savannah’s quest to find Joanne’s murderer is fun and full of red herrings. Savannah is a thorough investigator and it’s interesting following along with Savannah as she does the necessary research and questioning of suspects in order to find the guilty party. I admire Savannah for her persistence, but I sometimes cringe at how blunt she is when questioning witnesses who are supposed to be her friends. She definitely uses the “accuse first, ask questions later” approach to investigation which understandably angers some of the people of Parson’s Valley. I wish I could have taken her aside and told her to tone it down a bit! However, combined with information she learns from her husband Zach, Savannah’s assertive technique works, and she is able to find out things the local police can’t. Savannah and Zach make a good team, both in their marriage and in solving crimes. Savannah is smart, logical, inquisitive, and deeply in love with her husband. Zach is also intelligent and hard-working, loves Savannah and is supportive of her. To solve this murder, Savannah and Zach work separately and share the information they find, but don’t do a lot of questioning of possible suspects together. Seeing them work side-by-side would have made the book even more enjoyable. However, it’s still nice to have main characters who are a happily married couple who are so devoted and loyal to each other, similar to the relationship between Carolyn Hart’s Max and Annie Darling. The mystery is even more interesting because of the victim. Joanne is hard to get along with and not above a little blackmail to get her way, so there is a wide field of possible suspects in her murder. I liked that she is not portrayed as a totally evil person, and it’s her good qualities make the reader sad Joanne’s life was cut short by a murderer. Casey Mayes is a pseudonym of Tim Myers, so readers of his other cozy series will want to give this one a try. Fans of Ada Madison and Carolyn Hart will also find this mystery appealing. As a bonus, there are a few puzzles in the back of the book. The math puzzles were okay, but I found the instructions on how to solve them to be confusing. However, the mystery-related puzzles at the back perfectly complement the book and were fun to work. Savannah Stone makes her living creating puzzles for logic lovers but her life hardly follows a logical course. Who could have dreamed that Joanne Clayton would get a job for a local newspapers creating puzzles? A newspaper that has repeatedly turned down Savannah's work. Joanna Clayton knows nothing about making puzzles, all she knows how to do is spread gossip. There is no way this makes any sense but Savannah heard it directly from Joanne herself. Right there at the Cafe Noir. Savannah just w Savannah Stone makes her living creating puzzles for logic lovers but her life hardly follows a logical course. Who could have dreamed that Joanne Clayton would get a job for a local newspapers creating puzzles? A newspaper that has repeatedly turned down Savannah's work. Joanna Clayton knows nothing about making puzzles, all she knows how to do is spread gossip. There is no way this makes any sense but Savannah heard it directly from Joanne herself. Right there at the Cafe Noir. Savannah just wanted to have a little lunch alone, by herself, but Joanne barreled right up and sat right down at her table and took complete joy in telling Savannah her news. Thankfully a phone call from her husband Zach allowed her to make a hasty but graceful exit. The real bad news arrived later when Zach calls Savannah to tell her Joanne is dead. She had been poisoned. Retired police chief Zach has been asked to assist in the investigation. Will the police think "puzzle envy" is a strong enough motive for murder? Savannah decides to do a little assisting in the investigation herself to find out which of Joanne's many enemies may have wanted to get rid of the prospective puzzle maker permanently. I love the dynamic duo of Zach and Savannah. Think cozy mystery with a bit of police procedural added to the mix. While Zach follows the clues with Captain North, Savannah tries to logically sort through the facts and rumor. Together they seem to come to the correct solution albeit just not at the time. Savannah is a woman who will follow the lead, put herself in danger and scare her husband to death. These two even add to my gray hair and I love it. A Grid For Murder is the third book in the A Mystery By The Numbers series by Casey Mayes. Savannah Stone needs to go to Asheville to do some shopping and afterwards decides to stop be Cafe Noir for some refreshment before heading back to her home in Parson's Valley, that she shares with her retired police chief husband, Zach. Just as she finds a table, Joanna Clayton, waves and invites Savannah to share her table. Then Laura and Sandra, also from Parson's Valley are invited to the table. None of A Grid For Murder is the third book in the A Mystery By The Numbers series by Casey Mayes. Savannah Stone needs to go to Asheville to do some shopping and afterwards decides to stop be Cafe Noir for some refreshment before heading back to her home in Parson's Valley, that she shares with her retired police chief husband, Zach. Just as she finds a table, Joanna Clayton, waves and invites Savannah to share her table. Then Laura and Sandra, also from Parson's Valley are invited to the table. None of the ladies really want to be there, but don't want to be the next bit of gossip out of Joanne's mouth, either. Just as Susannah is getting ready to leave, Joanne thrusts a piece of paper at Susannah with a puzzle similar to those that Susannah does. Joanna proudly announces that she will be also making puzzles for a paper that Susannah had been trying to get to take hers. Upon returning home, a little later, Zach tells her that Joanna has died and it it later learned the she was poisoned. Knowing that once the information gets out about the puzzle Joanna was going to start, that Susannah will certainly be a "person of interest" to provide police with her information and an offer to help discover the murderer. A lot of residents of Parson's Valley would have liked to see Joanna dead. Parson's Valley being a small town, of course means there is a chance that you will alienate some of your friends, so Susannah has to proceed with caution. A few do get upset, but she is is able to get through the mystery without loosing any friendships. This third book in the 'A Mystery by the Numbers' series has to be my favorite one yet. Our sleuth, Savannah Stone only went into Asheville, NC to fax her latest math puzzle to her syndicate office, thought she would have a nice bite to eat outside and enjoy the fall weather at a cute cafe, The Cafe Noir. What happened is that she had a cup of tea with a woman who would shortly be a murder victim. Savannah, married to the former Charlotte, NC Police Chief, Zach Stone, finds herself among several This third book in the 'A Mystery by the Numbers' series has to be my favorite one yet. Our sleuth, Savannah Stone only went into Asheville, NC to fax her latest math puzzle to her syndicate office, thought she would have a nice bite to eat outside and enjoy the fall weather at a cute cafe, The Cafe Noir. What happened is that she had a cup of tea with a woman who would shortly be a murder victim. Savannah, married to the former Charlotte, NC Police Chief, Zach Stone, finds herself among several other persons that are heading the likely suspects list. While Zach volunteers to help the Asheville police, Savannah, not one to sit at home and await the chips falling where they might, decides to take a pro-active stance and heads off to begin her own investigation as to who wanted the unlikable Joanne Clayton dead. 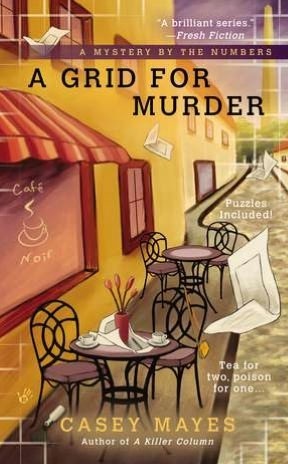 The cozy murder follows a comfortable path of deduction, so why do I especially like this novel? I like this book because it explores a good marriage, the resilience of friendships, new and old, and the triumph of good over bad. The dialog is so readable that you feel you are in the conversations. The situations Savannah finds herself in, may at times seem foolish, but never non-credible. As the saying goes, to paraphrase, 'Fools rush in where Angels fear to tread.' I enjoy the ease and honesty between Savannah and Zach Stone. Finally the book reminds you that secrets should be kept honest and not for hurting others. Decent cozy, though not quite enough atmosphere for me. Basically once our main character is on the case, that's all she does - stalk around town and question people. No working in of puzzles or atmosphere. No plot to have her accidentally overhear conversations, or learn things from third sources - just interviews and trips to City Hall/Hall of Records. I may go back and read the first in the series, but I hope it is a step up in the other elements. I wanted to really like this because I'm sick of so many of these involving someone dating (and I've been married for almost 13 years) but it just didn't work out as being a book I'd love, even though I appreciated someone in a happy marriage. Not bad, just not anything to get excited about. I enjoywd this book. The main character created math puzzles for a local newspaper. Her competitor gave her a hard time until she ended up dead. I didn't want to put the book down. * couldn't finish, ** wouldn't recommend, *** would recommend, **** would read again, ***** have read again. It's a mystery...the plot was okay, the writing was average. Slow and formulaic in the beginning. Quicker and more suspenseful toward the latter parts. Enjoyed the book for the loveable character Savannah. Surprisingly it was a hard book to put down and had me guessing til the end. I read this in one day. was very good. I really liked this series, wish there were more!